Hi there, my darlings!! 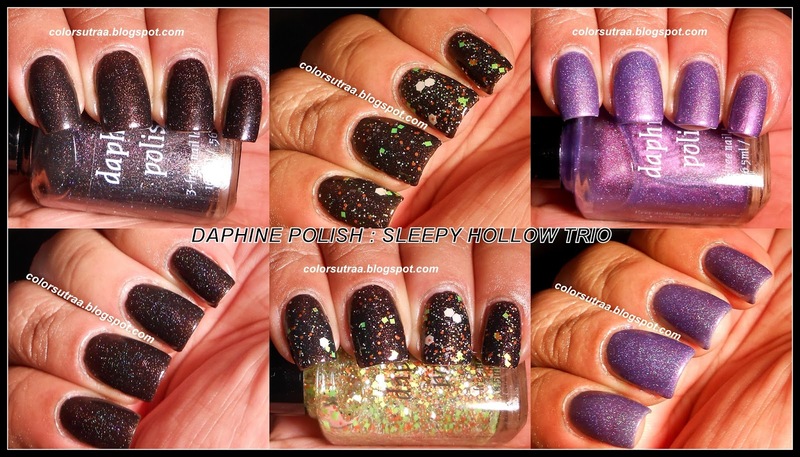 Halloween is just around the corner so I have yet another Halloween collection reviewed for you--this one is Daphine Polish's Sleepy Hollow Trio! When explaining her inspiration for her Halloween collection, Joanne mentioned that she grew up in Westchester County, where Sleepy Hollow is located and that she's heard stories of the legend all her life! Spooky, huh? So, it's no surprise that Joanne's very first Halloween collection would pay tribute to Washington Irving's Legend of Sleepy Hollow. though she did want to emphasize that she was going for polishes that weren't overly about Halloween but instead could be potentially worn year-round. 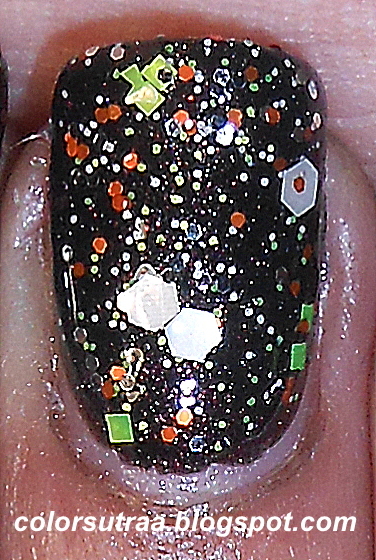 First up, I have for you The Hessian--A black holographic jelly polish with red sparkle. Deep, dark, and just a little bit sinister. I used 2 generous coats for the swatches below and had absolutely no issue with the application or formula. I love the pretty shimmer throughout this polish! Next up, I have for you Ichabod in Connecticut--A glitter topcoat with neon green, silver, grey, and orange glitters. Bright, bold, and perhaps just a tiny bit silly. I used 1 coat over 2 coats of The Hessian on all finger, except my ring finger where I used 2 coats, topped with 1 coat of G&G's HK Girl. No complaints with the formula or application--a quick swirl through the polish with the brush and glitters came right out! Finally, the third of the trio is Katrina Van Tassel--A purple holographic polish with red shift, perfectly coquettish and pleasing to the eye. I used 3 coats for the swatches below and the application was great--smooth and easy! So there you have it, my darlings!! The Sleepy Hollow Trio from Daphine Polish, which is available NOW on Daphine Polish's Etsy shop HERE. Do you need to add any of these spookily-themed polishes to YOUR stash? Which do you like best? I'd love to know in the comments section below! I'm in love with katrina van tassel!